Time is money. It is a simple phrase heard often enough, but in the world of professional contracting it can take on new and very real meanings. Whether you are trying to improve your labor cost to increase your bottom line or simply trying to get a job done faster so you can make it home for dinner or a hockey game, the time you spend in each part of you work process is a very real factor in the performance of your business. 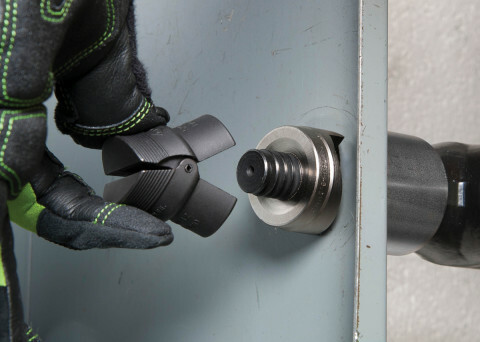 Greenlee is ever the tool manufacturer for the professional electrical contractor, and with the needs of this group in mind they have introduced the Speed Punch. The Greenlee Speed Punch eliminates a lot of the time spent setting up and dismantling after each punch. There is no need to thread a punch on to a draw stud and turn it until it is ready to complete. The Speed Punch simply slips on to the draw stud and has a lock that holds the punch in place. IF you are performing punches with any kind of regularity or repetition, this upgrade is certainly a timesaver and could help you get yourself or your crew home more quickly. Greenlee is so confident in the Speed Punch’s ability to save you time on the job that they are sending out comparison kits (complete with stopwatches) to their distributors so people that come in can try them out for themselves and see exactly how much faster they are. True to form, the Speed Punches slip on the draw stud easily every time, but it might take a little bit of practice to make sure the lock gets on there the way it needs to in the single fluid motion they show in the video below. You can find Greenlee Speed Punches at Ohio Power Tool, as well as a variety of other Greenlee Tools. If you have any questions about Greenlee or any other tool, be sure to call a pro at (800) 242-4424. This entry was posted in Electrician Tools, Greenlee Tools. Bookmark the permalink.